My prayers are with you and you family. Moms are special people, and we will pray for you and your family. (Name), you have my deepest sympathy! I am tremendously saddened for your loss. The memory of your Mother will give you comfort, and her legacy live through you all! God Bless your family. Your Mom always had a smile and a kind word. She was a joy to know. Heaven has added an Angel; your Mom was such a kind person. God bless you and your family and watch over you during this most difficult time. Moms are special people, we will pray for you and your family. Your Mom was a beautiful person inside and out, you and your family are in our mind and prayers. In loving memory of your Mother. From your Neighborhood Friends. Your mom was a truly an extraordinary woman and was admired by everyone who knew her. May time heal the sadness that you feel with the loss of your Mother. During these tough times, know that you are in our thoughts and prayer. We will pray for you and the rest of your family. God Bless your Mom. Thinking of you in the loss of your sweet dear mother. Love (Name) Family!!!! My heartfelt Condolence for the loss of your mother, we pray your faith will give you strength. The loss of your incredible mother has saddened us. You remain in our thoughts and prayers. We love you all SO much!! The loss of your mother has saddened our entire family, she was such a great friend. We hope the precious memories you carry in your heart will help you through this challenging time. You are forever in our hearts and prayers. Your Mother was the very best. We would like to express our sorrow and condolences to you and your family. Your Mother will be a part of our prayers from now on. I remember how much she used to love us, and take care of us, and be there for all of us. We will always consider your Mom part of our family. Your mother was a gift to everyone who ever met her. Sorry for your family�s loss. Your mother encouraged others to be the best they could be. That�s reflected in your life successes. I am so thankful that I knew your mother. She was a wonderful mentor. Your mother was always laughing and brought joy to all of us. Our condolences. Please accept our genuine condolences in this difficult time for you and your family. Loss of a Mother is a significant loss. We share your pain and are here for you. Your mother was a lovely woman and a dear friend, and the news of her passing saddened us all. Wishing condolences from our family to yours. I was devastated to learn of your mother�s passing. I offer my condolences, and I will be here for you and your family. Your Mother was an Angel to all of us. Stay strong; you are in our Prayers. Keep the memory of your Mother alive, and may you find the comfort you need. We are devastated to hear of your Mom�s passing. You are in our prayers, God Bless. May your Mom rest in peace and continue to guide your way in life. Losing a parent is never easy, may you find solace in the lovely memories you shared with your mom. Suffering the loss of your mother pains and stings unlike anything else. Please accept my sincere condolences and send much love to your family. May your Mom rest in peace. Please share our sympathies to your entire family. May his memory be eternal. Your Dad truly loved his family. Your dad was a kind man and a true gentleman, he always put others before himself. He will undoubtedly be missed. My sincere condolences. Your father was a remarkable friend, and his passing was tragic. We will be praying for your family. I am sorry for your loss. Your Dad was the pillar of our community and will be missed. Your family is in our prayers. Your Dad was such a nice man. It saddened us when we heard he passed on. Rest in Heaven. We are profoundly saddened for the loss of your father. You will be in our prayers. Your Dad always boasted about what a beautiful family he had. I know that you meant so much to him. Truly sad for your loss. I know, he will be looking out for you and your brothers always. That�s the type of guy he was. I worked with your Dad for over 35 years, he was a kind and honest man. Please, tell your Mom that we share her sorrow. Your Father has passed on, but his thoughts, hopes, and dreams live on. I am genuinely sorry for your loss. No condolence message can express how much your Dad meant to me and how sad I am about your loss. Your Dad was a fantastic man who loved everyone, we were privileged to work and golf with him. I want you to know that all the people that worked with your Dad are saddened. He was indeed a delightful man, and we will miss him dearly. I know how proud you were of your Father. His passing must me hard on the family. We are praying for you. I played high school football with your Dad, many years ago. Over the years he would mention what a beautiful family he had and thanked God for that blessing. He will be missed. Your Dad brought much joy to all his Golf buddies. As you grieve, I will keep you in my thoughts and prayers. I was saddened when I learned of your father�s death. (Name of Deceased) was a wonderful friend and co-worker. Your Dad was respected by all the people that worked for him. He was a true leader, and we will miss him. Condolences from everyone at the plant. I was shocked by the news that your Dad has passed. He was a great guy and will be missed by all of us. We are praying for your entire family. Please accept my heartfelt condolence of your father�s death. (Name of deceased) has found eternal rest. God sees and knows everything. He is with you right now. May fond memories of your (Relative) bring you comfort during this hard time in your life. My heart and prayers go out to you and your family. Our condolences to you and your family on the passing of your aunt. May our friendship and prayers ease you through this challenging time. The loss of your brother deeply saddens me. He will be truly missed, and I will include him in my daily prayers. (Name of deceased) soul is now free. Please accept my deepest condolences and know that God loves you and can restore your spirits, give you peace, and strengthen you. (Name of deceased) pain is gone, and it is our turn to deal with sorrow. (Name of deceased) has found eternal rest. I cannot even begin to understand what you�re going through right now, but I would like to offer my prayers and condolences. We are deeply saddened by the news of (Name) passing. Our thoughts and prayers are with you and your family. We/I are/am deeply saddened by the news of (Name of deceased) passing. Our/My thoughts and prayers are with you and your family. (Name of deceased) soul is now at peace. May my condolences bring you comfort, and may my prayers ease the pain of this loss. Prayers and fond memories are what we have to remember (Departed). We want to offer our prayers and condolences to you and your family. May God comfort you among the other mourners of Zion and Jerusalem. The hope of salvation is most important in our lives when death touches us. I�ll be praying for you and your family. God�s love and grace are always with you. Please accept our condolences and may our prayers help comfort you. We�re praying that the light of God�s face shines on you in the darkness of your grief. Your loss deeply saddens us; may our prayers guide his soul to our Heavenly Father. Sincere condolences! That you should know no further sorrow. (Name of deceased) is resting with the lord. May the soul of (Name of deceased) rest in peace. The thought of knowing that our loved ones are in the presence of the savior can be of some comfort. Heaven has received a new member. May God embrace you in comfort during this difficult time. We want to express our sorrow and condolences to you and your family. She will be a part of our prayers from now on. Everyone will eventually face death; the Bible has provided us with hope for life after death. Our deepest sympathy and prayers to you and your family, (Name of deceased) will deeply be missed. Our prayers continue for you, your mother, sister and family. May this throw give you warmth and comfort as you carry the memories of your father. Lori, I so wish I could be there today with you and your family. I loved (Name of deceased) as a brother. I will continue to love him and you all until we all greet one another in the Presence of Christ! Wishing you peace to bring comfort, courage to face the days ahead and loving memories to forever hold in your heart. Love, Our deepest sympathies. May the good memories see you through the difficult times ahead. We are all here for you! So sorry! We are here if you need anything! She was an amazing person! Those who have shown us love, brought us joy, and made us laugh, have given us the lasting gifts of a beautiful life - and blessed our memories forever. Our Sincere Sympathy. (Name) and I continue to remember you in our thoughts and prayers believing that God will provide you all that you need to endure. We hope you know how much you and yours are loved. We are so sorry. For you and your sisters, from all of us in your work Family. We know your dad had to be spectacular as he raised you. You are a wonderful legacy. A kind voice is just a phone call away. A loved ones passing is never easy. Allow the love of others to lift you in this time of grief. Allow yourself time to grieve tears can heal the soul. I am deeply saddened by (Name of deceased) death. I am very sorry to hear about the loss of your (Name of deceased). I don�t know what to say. This must be really tough for you. I want to express my condolences to you. I want to offer my deepest condolences. I want you to know friends who love you surround you. I was deeply saddened by the news of (Name of deceased) passing. I was truly saddened by the death of (Name of deceased). I hope you can hold on to the good memories. I�m always there in your hour of need. May her soul rest in peace. If we can provide you comfort, know our thoughts are with you. It was a shock to hear the news of (Name of deceased) passing. Let patience be upon you in this time of grief. Let the memories of (Name of deceased) life comfort you in his/her death. May the memories of (Name of deceased) help you find peace. May the passage of time heal your grief. May you find comfort in loving memories. My family and I were saddened to learn of (Name of deceased) death. My family extends to you our deepest sympathies. Please let me know of any way I can help you. Sorry to hear about (Name of deceased). It is never easy. My prayers are with you and your family. The news of (Name of deceased) death brings much sadness. There were few who could compare to (Name of deceased). We are consumed with sadness to learn of the tragic loss of (Name of deceased). We cannot begin to imagine what you are feeling but let us share our heart-felt condolence. We offer deepest condolences to you and your family. We pray the love for the lost is forever carried in your memory. Your family is surrounded by the love of many. Listed below are examples of simple condolence signatures to assist in selecting a closing that expresses your feelings. God rest my wonderful childhood friend and reward you for a lifetime of service to the lord. Deepest condolences to all of the (Name) family. I will always remember (Deceased Name) love for his family. After a lifetime of friendship, it is very difficult to say goodbye. Our deepest sympathy to your family. Thinking of your family, (Deceased Name) was a great friend to my parents and our family. Lord be with you at this time. She is safe in the arms of Jesus now. Our deepest condolences. So sorry to hear about (Deceased Name) - she was a dear, sweet person that had a lot of love in her heart! She will be missed!! Your family is in my thoughts and prayers. Had the pleasure of working with your Brother, everything seemed brighter when he was around. We share your sorrow. Our hearts ache for you during this difficult time. All of us from (School) High School, Class of '67 express our sincerest condolences to the family of (Deceased Name). She will surely be missed by everyone. Your Sister will be missed. I am a better person because of her. God Bless your family. Someone so special can never be forgotten, may his soul rest in peace. My families hearts are with you and your family, may (Name of deceased) rest In peace. Please be strong so that her soul can rest in peace. May (Her/His) the soul rest in peace. My prayers to the Almighty would be that may her soul rest in peace and may you stay calm. May the soul of your (Name of deceased) rest in peace. Rest in peace, (Name of deceased). And thank you. Condolences and Prayers to the Family ..RIP! Miscarriage Condolences Message- Focus on a basic, simple and loving message. I�m so sorry for your loss. I�m here for you. If you ever want to talk, I�m here for you. I know you must be hurting, and I'm here to listen. Now your an angel, even before you were born. I know your in heaven, but my heart is torn. I had only four months, to celebrate your life. The wonder of what you may have been, How I never got to hold you tight. When they told me your heart had stopped, I wanted to go with you. But I knew I had to be strong, and hold on. For god has taken my angel to a place far beyond. Lamento su p�rdida y quiero que sepa que orar� por la fortaleza, la paz y la comodidad para usted y su familia. I am sorry for your loss and I want you to know that I will pray for strength, peace and comfort for you and your family. Rezar� por ti y por tu familia. El amor y la gracia de Dios est�n siempre contigo. I will pray for you and your family. The love and grace of God are always with you. La esperanza de salvaci�n es m�s importante en nuestras vidas cuando la muerte nos toca. The hope of salvation is more important in our lives when death touches us. Estamos orando para que la luz del rostro de Dios pueda brillar sobre ti en la oscuridad de tu dolor. We are praying that the light of God's face may shine on you in the darkness of your pain. El cielo ha recibido un nuevo miembro. Por favor acepte mis m�s profundas condolencias y sepa que Dios lo ama y puede restaurar sus esp�ritus, darle paz y fortalecerlo. Please accept my deepest condolences and know that God loves you and can restore your spirits, give you peace and strengthen you. Nosotros / yo estamos / estamos profundamente tristes por la noticia de (Nombre del fallecido) que pasa. Nuestros / Mis pensamientos y oraciones est�n con usted y su familia. We / we are / are deeply saddened by the news of (Name of the deceased) that passes. Our / My thoughts and prayers are with you and your family. Las oraciones y los buenos recuerdos son lo que debemos recordar (Partidos). Prayers and good memories are what we must remember (Matches). Que nuestro Señor los bendiga y consuele a usted y a su familia durante este tiempo de dolor. May our Lord bless and comfort you and your family during this time of pain. Que el alma de (Nombre del difunto) descanse en paz. May the soul of (Name of the deceased) rest in peace. Nos gustar�a ofrecer nuestras oraciones y condolencias a usted y su familia. We would like to offer our prayers and condolences to you and your family. Que Dios te abrace con comodidad durante este tiempo dif�cil. May God embrace you comfortably during this difficult time. Lamento profundamente esta gran p�rdida. I deeply regret this great loss. Isa�as 41:10 no temas, porque yo estoy contigo; no desmayes, porque yo soy tu Dios; Te fortalecer�, te ayudar�, te defender� con mi mano derecha justa. Isaiah 41:10 Do not fear, for I am with you; do not be dismayed, because I am your God; I will strengthen you, I will help you, I will defend you with my right hand. Why Send a Condolence Message? Many times we we think the grieving individual wants space, but that is usually not the case. Condolences bring comfort to the bereaved and let them know that you are thinking of them. This is particularly meaningful if you are far away and unable to attend the funeral or remembrance service. Expressing condolences can be difficult, heart-breaking, awkward, distressing and sometimes even embarrassing. It is not something one does everyday and very few people can claim to be skilled at this. Very often, people simply feel that it is better to ignore the event and carry on with your life, leaving the bereaved to sort themselves out and come to terms with the death. Here are a few points to re-consider if you are in two minds about sending condolences. Not expressing condolences can have long lasting subconscious negative effects that will worry you - ignoring the event is not good for your well-being. It can leave you with a sense of unfinished business that will niggle for years to come. Meeting up with the bereaved friends or family at a later stage may raise feelings of embarrassment and tension, knowing that you did not send condolences. Sending condolences gives you a sense of calmness and clarity. It allows you to take time and evaluate your relationship with the deceased. It lets you ponder and express your thoughts in meaningful words. You don't have to write screeds, a few simple lines will do. Find words that will bring joy to the mourners. Highlight a special quality, an event, a warm anecdote or a community deed that the person did. Condolences bring comfort to the bereaved and let them know that you are thinking of them. This is particularly meaningful if you are far away and unable to attend the funeral or remembrance service. Once the trauma is over, friends and family will sit down and read the condolence notes. Your words will bring comfort, guidance and support and help them deal with the passing. Very often the family are in a traumatic state and are not able to talk to you. Sending condolences is a way to reach out, make contact and let them know that you are thinking of them. If you are able to offer help, your condolence message can include that as a suggestion. Family may help to do errands and tasks that they are unable to deal with. Your message will make it easier for them to ask for help. Take the time and do the right thing. 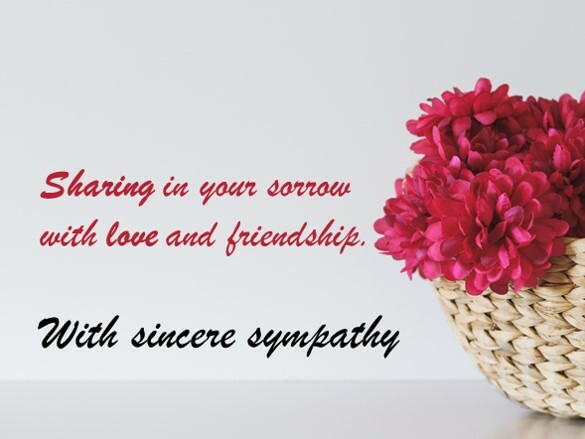 If you are not good with words and are struggling to decide what to say, take a look at our selection of condolence cards and messages. They will give you ideas and help you choose the correct thoughts and words to convey your feelings. Should I Send A Condolence Message? When you learn about the death of a person, you are filled with a variety of emotions. These will vary depending on how close you were to that person or under what circumstances your lives touched one another. Letting the bereaved know that you care will mean a lot. Reaching out and offering your condolences is always a good choice. You could be a very close family member or a life-time friend, in which case this event will be both traumatic and devastating. Perhaps you are a distant relative who didn�t have much contact but are still saddened. People you interact with daily in the work place could be friends, respected colleagues, admired mentors or even not-well-liked. But, their passing will leave you with mixed feelings on how to deal with this. Neighbors, members of the community, your local Church, book clubs, gyms and other recreational venues have been part of your life and their passing should be acknowledged in a dignified and thoughtful manner. Many people are not good with words and struggle to find the appropriate thing to say. Our selection of condolence cards and messages will give you ideas and help you to choose the correct words to convey your feelings. A loved one is probably the most difficult. Try to include some personal mention of happy moments that will bring comfort to the bereaved when they read it. A close friend can be remembered by special times spent together and memories shared. Acknowledge co-workers by telling the bereaved how they impacted on your life on a daily basis or inspired you, as you spent many hours together in the work place. Neighbors can be remembered with thanks for their support and friendship. Community members can be acknowledged for their work and dedication to the neighborhood and local initiatives. Always be true to yourself. Don�t write words that you don�t feel are true. If the person was not close to you, simply express condolences and good wishes. If the person was close, a personal note will bring much needed comfort to those reading the condolence messages. Writing an effective and meaningful condolence can help the grieving individual get through a difficult period. It�s important to correctly express your sorrow and offer appropriate support. Foremost, Take into consideration the relationship between the the person grieving and the deceased. The condolence message would be different for an immediate family member such as husband, father, or child rather than a cousin or family friend. Another consideration would the circumstances of the passing. Was the deceased older and passed from natural causes or a younger person that died in an accident. Occasionally the death may have been the result of drug overdose or suicide. Religious beliefs can influence the message. �May his soul rest in peace� or a favorite Bible Verse would be comforting for a deeply religious person. A Sympathy Quote such as �Unable are the loved to die, for love is immortality - Emily Dickinson� would provide solace to a non-believer. After you�ve thought about the consideration above, look at the the list of suggested Condolence Message and select one or combine several. Offering condolences is difficult for most people - it is not something we do everyday. How does one write words that are honest and meaningful without sounding awkward or simply saying the wrong thing? Being old and dying peacefully in your sleep is a blessing that very few will have. 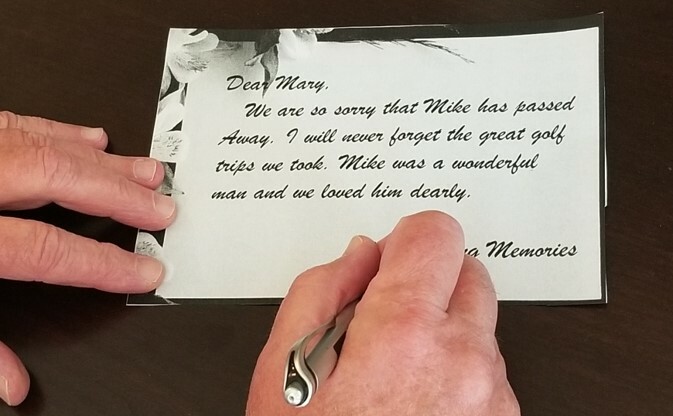 Many people die under tragic or difficult circumstances, making the writing of a condolence note even more of a challenge. 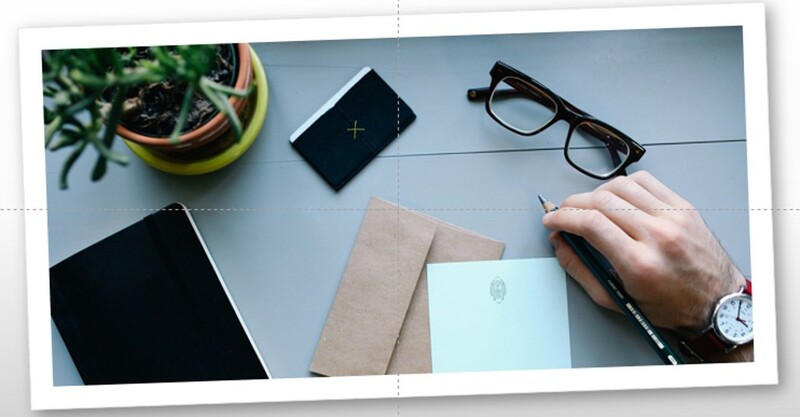 Here are some ideas to help you write a meaningful note under difficult circumstances. Many families have rifts. Sisters and brothers don�t talk to one another, parents and children fall out. When someone dies, these rifts take on another perspective, often leaving you with the helpless feeling that �it is too late to make amends�. Choose simple words and indicate that you wanted to heal the rift but didn�t know how. The bereaved will at least have that measure of comfort in years to come. Strained friendships are part of life and take on a new dimension when someone passes on. If you learn that a friend�s loved one has passed, send a condolence note. Mention that you miss the wonderful times you shared and that you would love to rekindle your friendship when they are ready. A boss or work colleague you dislike passes on � it may be terrible to say but in real life some people might feel relieved or even happy. Keep these thoughts to yourself and in no way pass them onto the grieving family. Write a simple note that offers condolences, don�t say anything negative and leave it at that. Suicide is a shock for all and can leave close friends and relatives with feelings of guilt. Your condolence note is not the time to pry and ask for details. These issues can be dealt with at a later stage. Tragic accidents are a part of life. Express condolences and don�t ask for details. The bereaved often do not want to talk about the event and prefer to be reminded of happy memories or anecdotes about the person. Be aware of religious issues. Saying things like �She is happy in Heaven� may upset people who do not have the same cultural beliefs as you. Avoid references like this unless you are sure of the religious beliefs of the family. Illness and death. Avoid clich�s like �He is better off now�. These statements do not help the mourners. Rather focus on a personal good memory and write about that. The family will read your message at a later stage and gain comfort from it. 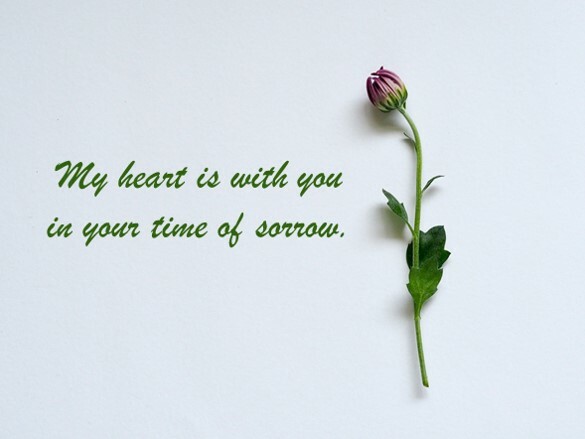 If you are struggling to write a condolence note, browse through our messages and cards. They will give you ideas and help you find the meaningful words you need. May the memories of your beloved (Name) soften the grief in your heart. The heart remembers greatest what it has loved best. May loving memories comfort you and bring you peace. (Name) sure was lucky to have you in her life. (Name) had such a marvelous life with you. I�m so sorry you had to say goodbye. (Name) was fortunate to have had you love them so much. I am sorry for your loss. (Name) will be greatly missed. You�re not alone. I understand your grief and know there�s a hole in your heart. I�m here. You loved (Her/Him) with everything you had; that�s what all pets want the most. (Name) was one in a million. Understanding that the person is suffering grief and despair will help put you in the right frame of mind. They need to mourn and heal in the same way a person would do after losing a loved one. For older people who live alone, a pet is sometimes the only companion they have had for years and the loss can be devastating. Will say it�s time for feeding. Children can be traumatized by the death of a pet. This is often the first real-life experience of death, making it all that more difficult to cope with. Couples who are unable to have children often treat their pets as children and are just as devastated when they pass on. Here are a few things to keep in mind when talking to a friend, or writing a condolence note, after a pet has died. Try to use the name of the pet if you know it. Pets are part of the family and have names like everyone else � not just �dog� or �cat�. Ask if they need help with anything. Sometimes removing the pets toys, eating bowls and bedding can be traumatic. If you are up to it, they may welcome your help. Include a fun anecdote or a fond memory in your condolence message about an experience you had with their pet. At a later stage, the bereaved will read the messages and get a sense of comfort. Don�t say things like �When are you getting another one?�. It will certainly upset the person � you would never say that if a child had passed on. Don�t mention your own experiences of a pet dying - it is not the time or place. Let the person talk and be a good listener. If a pet was put to sleep, the person is probably dealing with feelings of guilt and remorse. This is not an easy decision to make and you cannot pass judgment. Simply listen and offer support. Don�t say things like �She was old and it was for the best�. Those are not the feelings that the mourners are experiencing. Imagine that the pet was a person and you will get the correct perspective. Browse our collection of condolence messages and cards - they are ideal for pets too. The suggestions will help you find the correct words to say, offering comfort to a grieving friend or loved one.